Nothing says summer fun like a party by the pool. You can turn your backyard into a fun summer resort with very little effort. Do not just throw a pool party; you want to throw the best pool party! Forget about throwing a few cans of soda into the cooler, setting up an umbrella and a few chairs, and calling it a party. You can transform your backyard into the ultimate pool party. Here is a list of pool party ideas that will give you a nudge in the right direction for planning and throwing your own pool party. • Club Theme – turn your pool and backyard into a posh party! You can hang white or colored outdoor lights around the backyard fence. Find plastic drink ware that has a sophisticated flair and serve brightly colored drinks. Have a variety of floating pool chairs for people to lounge on while sipping drinks. You can BBQ mini burgers to make sliders with and consider sweet potato fries instead of regular French fries. • Movie Theme – Nothing will set your party apart like turning your backyard into a movie screening! You can rent a projector for the night and hang a white sheet in your backyard to show the movie on! Pick a movie that is appropriate for all ages if children are present! Have a variety of lawn chairs and floating pool chairs for your guests for watching the movie. Serve burgers, hot dogs, popcorn and have an assortment of candy. • Luau – Everybody loves a Hawaiian Luau. You can use tiki torches around the yard for light. Ask guests to wear Hawaiian prints and hand out leis to your guests. If you have a lot of kids at the party, you can even have them make the leis using string and fake flowers, with their parent’s help of course. You can find tropical party favors to decorate with and you can even float flowers on the surface of your pool. Use pineapple chicken, bbq chicken and a big selection of fresh fruits. • Beach Theme – Bring the beach to your yard! Use beach chairs and towels to decorate the yard with. If you have a kid’s sandbox, build a sandcastle in it. Use plastic pails full of ice to keep drinks cool. Serve snacks on clean plastic shovels or Frisbees. Have classic beach food such as burgers, hot dogs, potato salad, and corn on the cob. Those are just some of the themes that you can do but you can have any theme that you want, such as pirates, Vegas, or Hollywood. No matter what theme, your printer can help you make fun and eye-catching decorations and invitations. Look for colors and shapes that capture the essence of your theme, or if you are not having a theme, that invokes a sense of summer fun. You can print out name holders, and banners on colored card stock to decorate with. If you want people to really interact and have fun, consider adding fun pool toys and games for people of all ages to enjoy. You can get a portable basketball hoop for playing in the backyard or to set next to the pool so your guests can enjoy from basketball from the pool. 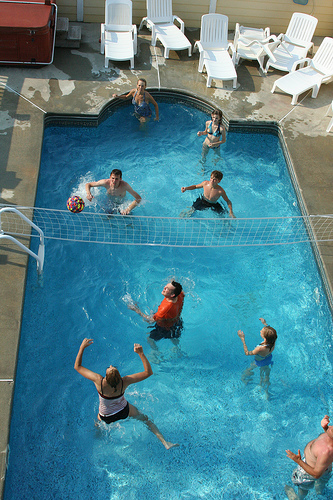 Floating ping-pong tables are also a popular choice and there is nothing wrong with water volleyball, all you need is the net. If you have kids present, look for pool toys and games suitable for kids. Diving games are fun for kids; you can play in the shallow end for the smaller kids and in the deeper end for older kids. Since it is a pool party and guests will already be wet, why not have a water fight? You can set up baskets of water balloons and squirt guns around the backyard for your guests. Hula-hoops are always fun, you can have contests to see who can hula hoop the longest; for more fun, use a pole for a limbo contest. Location matters with a pool party, so set the food away from the pool to keep it from getting too wet. Nobody wants food and snacks that taste like chlorine, so set your food a safe distance from the pool. You can set up an awning to put it under to keep it shaded. Have drinks available near the pool, or use a floating ice chest, so guests in the pool can just paddle over to replenish their drinks. You should have a variety of patio furniture for guests to sit on, also set away from the splashing water of the pool. Keep some lounge chairs near the pool for guests who want to lounge and tan in the summer sun. Another pool party idea is to make sure that your guests have what they need, keep a supply of dry towels on hand, extra sunblock, a few pairs of sunglasses and even some extra flip flops. When night falls, have citronella candles around to help keep the bugs at bay. The best part about a party is the chance to showcase some dazzling foods and desserts. Think simple when it comes to feeding the crowd. You do not want to be stuck in the kitchen while your guests are having fun, so have something that you can make a lot of and bring out in a buffet dish or chaffing dish, or bbq, where you will be out in the action. Burgers are fun and easy but you can make them gourmet by giving guests the option to add blue cheese to their burger, or other gourmet toppings. Fresh fruit salad is a popular favor, and you can serve it in a halved out watermelon. Offer to grill veggie burgers and also have some chicken. Guests love to have a variety and those are simple and healthy alternatives to burgers. For snacks, you can make blue Jell-O and pour it into individual small cups to make single servings. When it has set, on top of each cup of Jell-O you can set a jelly ring, a drink umbrella and then inside the jelly ring, a Teddy Graham. Tasty and fun! Serve grapes and strawberries in waffle cones for a fun way to carry the snacks around and the cones will also be tasty to eat as well. For drinks, have pitchers of lemonade, and water with lime and lemon slices or even with sliced strawberries or cucumber slices. This gives your guests a hydrating drink that is more than simply water but it will have a subtle flavor that will please and satisfy.